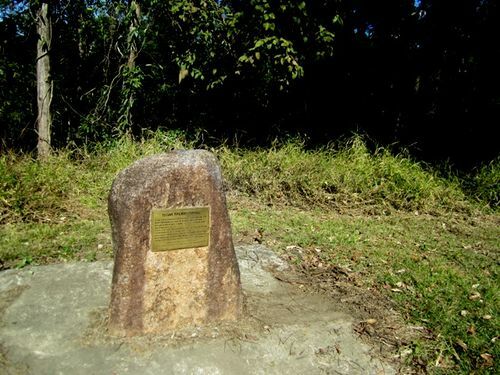 Memorial marks the site of the Yugar Railway Tunnel which formed part of the now closed Ferny Grove - Dayboro railway line. The line was closed by the Queensland Government in 1955 due to declining traffic. The University of Queensland now uses the tunnel for research into bat colonies. The tunnel in the gully below this site was built in 1918 and is the only railway tunnel in the Pine Rivers Shire. Measuring 269ft (82m) long, this concrete tunnel came into use on the 3rd March 1919 when the Samford to Samsonvale section of the Dayboro railway line was opened for traffic. It's useful life as a railway tunnel ceased on 1st July 1955 with the closure of the Ferny Grove to Dayboro section of the line due to declining traffic. After its closure, the northern end of the tunnel and the gully in which it was situated was used as a rubbish tip until 1983, when the tunnel came under the control of the University of Queensland for the purpose of research into the bat colonies that live within the tunnel.